Your ultimate tool storage cabinet has been revamped! The redesigned Performance Plus 2.0 Series 5-Drawer Tool Cabinet is made fully welded with 18-gauge steel frames and fully lockable double-walled doors. Features full extension drawers on ball-bearing soft close drawer slides, a customizable drawer divider for tool organization, protective foam liners that cover each drawer to keep your tools in place, as well as an integrated top tool tray with premium rubber liner for easy tool accessibility. 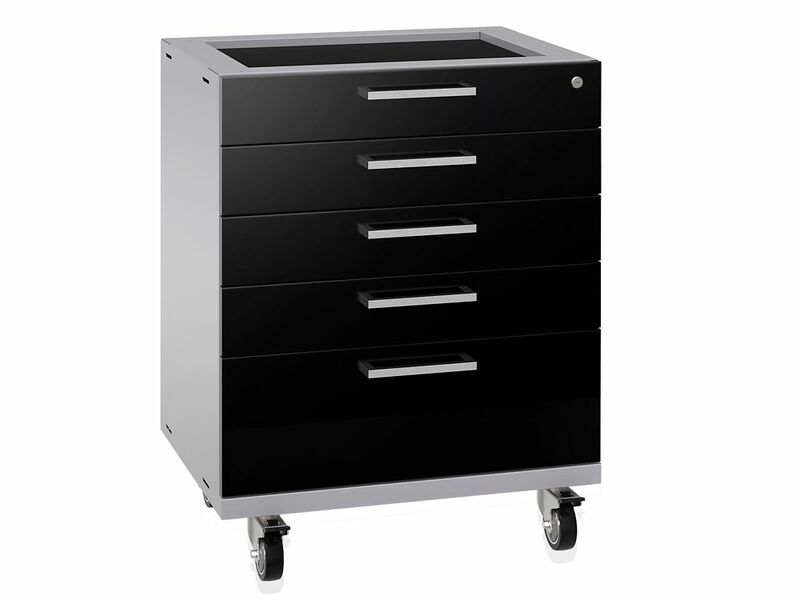 Interchangeable drawers allows for customization to your storage space creating a 4, 5 or 6-Drawer Tool Cabinet. Shipped with heavy-duty lockable casters for full mobility; bolt it together to another Tool or Base Cabinet creating a mobile workstation. It can also be installed on the included height adjustable levelling legs. The Gladiator Pre-Assembled Rolling Garage Cabinet stands close to 5.5 ft. tall to accommodate items of various sizes and add versatile storage options to your garage area. When secured to the GearWall panels or GearTrack channels (sold separately) with the included hanger bracket, you can easily install and reposition this cabinet. When GearWall panels or GearTrack channels are not used, you can attach it to wall studs. Safely house your equipment out of reach with built-in locking doors and a round drawer lock. The Ready-To-Assemble 3/4-Door Wall GearBox features an open bottom shelf with power cord access to easily connect tools, electronics or battery chargers to a power source. This heavy-duty steel cabinet with smooth white finish and steel doors is as tough as it looks. Perfect for storing smaller items and gear in utility rooms, mud rooms, entry ways or the garage. It easily mounts and repositions on Gladiator GearWall Panels or GearTrack Channels with the included brackets. Like many Gladiator products, this cabinet is backed by a 10-year limited warranty. This Gladiator Freestanding Steel Cabinet stands at 6 ft. tall, 4 ft. wide and 1.5 ft. deep accommodating anything from over-sized items such as tents to plastic storage tubs. Its 4 levels of storage provide room for gardening tools, paint supplies, large tools and automotive gear. The EZ design makes assembly fast and easy, while an optional separately sold Wall Bracket Kit lets you get the cabinet off the floor using separately sold Gladiator Wall Systems. The Gladiator Premier Modular GearBox offers versatile and accessible storage for a variety of gear. A shelf with a cushioned liner, riding on full-extension ball bearings, slides effortlessly for smooth operation. This storage cabinet holds up to 1400 lb. and docks efficiently under a Gladiator Modular Workbench or can stand alone as an additional work surface or tool stand. Performance Plus 2.0 Series Tool Drawer in Black Your ultimate tool storage cabinet has been revamped! The redesigned Performance Plus 2.0 Series 5-Drawer Tool Cabinet is made fully welded with 18-gauge steel frames and fully lockable double-walled doors. Features full extension drawers on ball-bearing soft close drawer slides, a customizable drawer divider for tool organization, protective foam liners that cover each drawer to keep your tools in place, as well as an integrated top tool tray with premium rubber liner for easy tool accessibility. Interchangeable drawers allows for customization to your storage space creating a 4, 5 or 6-Drawer Tool Cabinet. Shipped with heavy-duty lockable casters for full mobility; bolt it together to another Tool or Base Cabinet creating a mobile workstation. It can also be installed on the included height adjustable levelling legs. Performance Plus 2.0 Series Tool Drawer in Black is rated 4.8 out of 5 by 16. Rated 5 out of 5 by KK from Sturdy construction, high quality parts and painting. All four casters... Sturdy construction, high quality parts and painting. All four casters swivel, convenient for maneuvering in a tight space. Rated 5 out of 5 by Nick from Strong and sturdy This is my 2nd set of performance plus 5 drawer tool cabinets. Purchased my 1st set a few months ago for my garage and I realized how awesome they really are. Just purchased my 2nd our retail business and use them behind/under the front counter. The soft close drawers are great, the rollers drawers glide even easier with more weight you add. The finish on the black gloss is immaculate and they look perfect, even in a retail store front setting. Delivery and packaging is quick (1 week for both orders) and they are shipped on heavy duty pallets with banding binders. Highly recommend..!!! Rated 5 out of 5 by jamesH from Sturdy 5 drawer base cabinet Great 5 drawer base cabinet for my garage workshop. Drawers roll smoothly and the casters are solid. roll easily to my work areas in the garage and locks in place with wheel tabs. solid enough to work on top of and to have tools placed there while working. have purchased several of these and the related 2 door base cabinets. pricey but worth the month compared to the cheap and wobbly other products on the market. Rated 5 out of 5 by Mark from Surprisingly good. I actually had lower expectations for this. This is the Performance "Plus" l... Surprisingly good. I actually had lower expectations for this. This is the Performance "Plus" line, not the Performance line. I was worried that it would get damaged during shipment, but it was well packaged and robust. It came with hardware to install to the wall, casters, or legs. It even came with drawer liners. It is heavy duty for my needs - heavier steel, ball bearing slides, soft close doors, and lockable. Compared to my Craftsman tool chest, this is actually superior. I like that you can bolt multiple ones together to make a large cabinet or built it. Good quality. Hello, Thank you for your inquiry. The overall dimensions for the cabinet are 28&quot;W x 22&quot;D x 32.25&quot;H. The height will increase to 37.25&quot;H once installed with casters (included with the cabinet). If you have any further questions feel free to email us or call us at 1-877-306-8930 (Option 1) and we would be more than happy to assist you. What is the inside clear height, width &amp; depth of each of the drawers. Thank you for your respective inquiry. The top 4 drawer internal dimensions are 24.75&quot;W x 19.5&quot;D x 4.0&quot;H and the last drawer is 24.75&quot;W x 19.5&quot;D x 9.5&quot;H. If you have any further questions feel free to email us or call us at 1-877-306-8930 and we would be more than happy to assist you.